I’m back from Spain. I met the most wonderful, blasé cooks, dined on out of this world cuisine and saw the most amazing sights. Just kidding, you know I would love to go but can’t afford it. I’m lucky to be able to afford to drive a county over. Which reminds me, while getting gas I saw a truck selling shrimp across the highway in my small town in southern Minnesota! What says fresh shrimp like an unmarked truck in an auto parts store parking lot with a large sign that simply says ‘shrimp?’ I pointed it out to Greg and we both had a chuckle. I think he chuckled both because he was surprised I didn’t go over and amazed at the sight. I’ve heard horror stories that begin like this and end with “and I was sick for a week” and by heard I mean have seen in movies. However, I am just odd enough, who am I kidding, I am so damn weird that I would have stopped had I not bought shrimp the day before. There is a stigma attached. I remember times in Indiana when mushroom season was upon us and we bought morels from the back of a van for $25-30 a pound. Normal because it was mushroom season- is it shrimp season? Is there a shrimp season in an area that doesn’t produce the item? (Is anyone listening to me? Happy Gilmore reference and my own life.) My mind won’t leave the point that it’s a small town in a landlocked area. I do this though, I might mock something but still stop by or do it and sometimes I am not mocking something but sound as if I am. I give people, events and products the benefit of the doubt…most of the time. 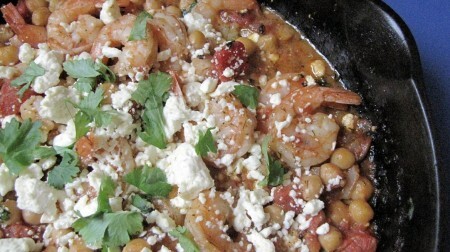 I can’t say enough about this dish-baked shrimp with tomato, feta and chickpeas. This is a new staple recipe in my apartment. Fast, easy and it looks attractive without even trying. This recipe comes from the magazine Fine Cooking but I modified it so that a side dish was not necessary. I added chickpeas but you could add cannellini beans or another bean of your choice, perhaps add some rice or serve with a crusty loaf of bread. I didn’t have any on hand but a dash or two of white wine would be nice as well. Preheat oven to 400. Heat the oil in a large, oven-proof skillet over medium heat. Add shallot and cook on stovetop until softened, about 3-5 minutes. If using white wine, add here and then, stir in tomatoes and simmer until it thickens a bit, then add chickpeas. 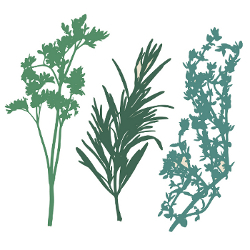 Cook for about 5-10 minutes and then take off of the heat and stir in herbs, shrimp, salt/pepper and feta. Place in oven (uncovered) for 20 minutes or so, until shrimp are cooked. Serve with rice or crusty bread.